Timothy Schaffert draws upon L. Frank Baum's Oz mythology for his gorgeous fifth novel, The Swan Gondola. Over the past century, L. Frank Baum's The Wizard of Oz has inspired a wide range of adaptations and derivative stories, a number of them closer in spirit to the 1939 film than they are to Baum's original children's novel and its whimsical sequels. Nearly every one of Baum's characters has provided fodder for a new interpretation, from Geoffrey Maguire's novel-turned-musical Wicked: The Life and Times of the Wicked Witch of the West told from the perspective of Elpheba, the Wicked Witch to the bloated and uninspired 2013 Hollywood blockbuster Oz starring James Franco. 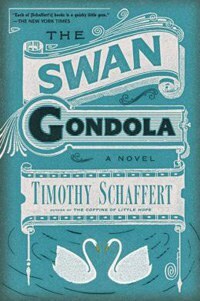 Most recently, the novelist Timothy Schaffert has drawn on Baum's Oz mythology for his gorgeous fifth novel The Swan Gondola. Set in 1898 at the Omaha World's Fair, The Swan Gondola clearly exists in the same world as Baum's, a world of sweet pea extract, licorice-flavored tonics that promise to end baldness, cyclones, hardscrabble farm-folk on the frontier, and humbug magic. Class plays an important part in this world, we are told that the Fair seemed to those "in the city's lower, dirtier parts, the folly of the wealthy and their wives." But Schaffert's fable amplifies the atmosphere of weirdness that exists in Baum's world, almost venturing into steampunk. And the allusions to Oz can be ignored, if you wish. If you try too hard to draw connections between Schaffert's book with Baum's, the story might not stand up under the strain. But the novel does feels richer viewed through the lens of Oz mythology. Schaffert acknowledges the allusions, noting that he consulted with both the text and W.W. Denslow's classic illustrations. In places the novel reads faintly as a prequel to Baum's book, starting with a stolen hot air balloon that has crashed into the house of two elderly women, Emmaline and Hester — the Old Sisters Egan. Ferret performs at the Empress Opera House with a puppet named Oscar. It is there, a few weeks before the Fair, that he glimpses a beautiful actress named Cecily who is an understudy for an actress who plays a 'violet-eyed trollop'. She works in a troupe of traveling actors and Ferret waxes rhapsodic about her from the first. He soon finds her again, working as Marie Antoinette in the Chamber of Horrors. Every night, she rushes away, mysteriously clutching a carpetbag. Ferret pursues a romantic relationship with Cecily, taking her for a ride one night on a dilapidated swan gondola that exudes "shabby romance." The Fair's magic makes her fall in love with him, too. Her carpetbag holds her illegitimate baby daughter "Doxie" (short for Dorothy). The three live together and though Ferret never saw himself as the father or husband type, he falls deeply in love. The trouble starts when the couple develops a relationship with a wealthy entrepreneur and widower Billy Wakefield. Ferret actively enjoys what he imagines is Wakefield's envy of his romance with Cecily. In a shortsighted move, Ferret sells Oscar, his livelihood, to Wakefield. On the same night, Cecily starts to show signs of illness. Billy promises to cure Cecily's ailments, at first subtly positioning himself as her savior and then openly creating obstacles between Ferret and Cecily. He poisons Cecily against Ferret and the bulk of the novel is devoted to the question of whether Ferret will ever get her back. A gossamer-thin plot transmutes into a ghost story late in the novel. The meaning of the haunting remains mysterious and at moments, it feels vaguely humorous, though it is also always lovely. The swan imagery, for example, evokes the idea that Cecily and Ferret are truly in love (swans are monogamous), but this image, like much of the sensory detail, is amped up and exaggerated to nearly comic effect. At one point Ferret encounters a profusion of swan imagery and tells the reader: "The world was ridiculous with swans — a hat, a soup tureen, a pincushion, a flowerpot, a perfume bottle, a flask. A lap harp, a salt cellar, a candy dish." Most of the characters from the first part of the book come back to play an important part in the novel's later twists. The strong sense of system — suggesting that the careful allusions combine to make the whole book one giant Oz puzzle —makes a reader want to decode the book, to find a deeper Baum-related meaning that does not fully reveal itself. But this is not a book for skeptics or cynics or puzzle-solvers — neither magic nor love typically serve a rational agenda. The right readers for this novel are readers who are true romantics. When a love story is the focal point, it can feel important that the characters deserve each other: that they have qualities that work in tandem. While Ferret is far from saintly, his obsessive devotion to someone as quixotic and fickle as Cecily can occasionally feel stretched thin over the course of hundreds of pages. But romantics won't mind that Cecily is not quite as entrancing as Ferret thinks she is. This is a story that is concerned with illusion, after all. The most bewitching aspect of the novel lies in how Schaffert puts forward one love story, only to make the readers fall in love with another. Schaffert pulls off a second love story with exquisite style — the readers' romance with a turn of the century milieu of carnies, seances, misfits suffering from unrequited love, and humbug magic.